A common argument among collectors and investors is: “Are Proof coins better than Mint State coins?” There are many different opinions to this debate but it boils down to one major issue – is there a demand for the coin? First, let’s look at each type separately. When speaking of mint state coins minted prior to 1933, these coins were produced for the sole purpose of monetary transactions. The number of the coins that were produced each year was directly tied to the need for more currency and the availability of gold and silver. Through the years as the population grew, mintage figures increased as the demand for circulating currency grew. For example, let’s look at the $2.50 Quarter Eagle. The first Quarter Eagle was produced in 1796 and had a mintage figure of just 963 coins. In 1821, 6,448 of the coins were produced and by 1836, the mintage was 547,986 coins. As these coins circulated through the populace as currency, the condition of them deteriorated, making examples in high grades very hard to acquire. Now, let’s look at the modern Gold Eagles. These coins are minted for the purpose of bullion ownership for individual investors. By law, the U.S. Mint must produce these coins to meet the demand of the public. The first $50 Gold Eagle was produced in 1986 and because it was the first U.S. gold coin minted since 1933, demand was high and the mintage figure totaled 1,362,650 coins. Through the following years, the mintages ranged between 200,000 and 500,000 coins. But in 1999, because of the Y2K scare, mintages soared to 1,505,026. Mintage figures remained at normal levels until the next financial panic in 2008. A total of 1,493,000 $50 Gold Eagles were produced in 2009. Because these coins were not circulated, their condition typically remains Brilliant Uncirculated in most cases. A small percentage of the coins will receive a perfect MS70 grade. There are certain years and denominations of the Gold Eagles that are rare in high grades. An example of this is the 1991 $25 coin (1/2 oz). With a mintage of only 24,100 coins, a MS69 example can bring as much as $2500, since even in this less-than-perfect condition, the supply is very low. Proof coins differ in appearance from Mint State coins. The term “Proof” refers to the method of manufacture and not the condition of the coin. Proof coins are struck on a highly polished planchet giving the fields a mirrored effect and the image has a frosted look. Mint State coins just have a matte finish on the entire coin and often include minor imperfections due to handling during the minting process. Pre-33 proof coins were originally minted and given to members of Congress, placed on display at exhibits and gifted to government VIPs. These coins were never intended for general circulation. Most pre-33 gold proofs had a mintage under 100 coins and for silver less than a 1,000 coins. All pre-33 proof coins are considered to be quite rare. Modern Proofs are manufactured in gold, silver and platinum. These coins are sold by the U.S. Mint directly to the public. The mintages of these coins are always a fraction of what is produced for bullion. Oftentimes, the Mint will set a production limit or only produce them for a certain period of time. 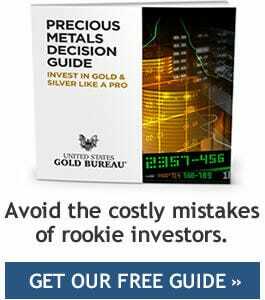 These proofs are intended for collectors and trade at a much higher premium above the spot price of gold. So, the question remains … which is better? The answer is simple. The coin that has the most demand and a limited supply is always the best coin to own!